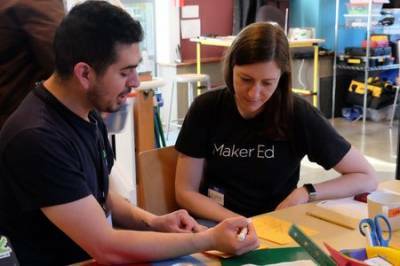 Maker Ed is a non-profit educational organization based in Berkeley, CA. Our mission is to harness the potential of maker education to transform teaching and learning! We have just moved to a new location in West Berkeley: the Maker Ed Community Studio is the main training center and event space for our organization. The Studio is also available as a rental space for community events, workshops, and camps, and as a tinkering and prototyping location for other maker education practitioners. Our first open-to-the-public event, the Community Studio Launch Party, will feature a do-it-yourself pancake and brunch station with local chefs, a signature cocktail from Bar Agricole, hands-on making activities, a silent auction, and much more. Kids are welcome to attend! We're very excited to invite you to come see us in our new home, and hope you’ll join us!